It's been raining a lot, but I can't complain. Life is beautiful no matter what. 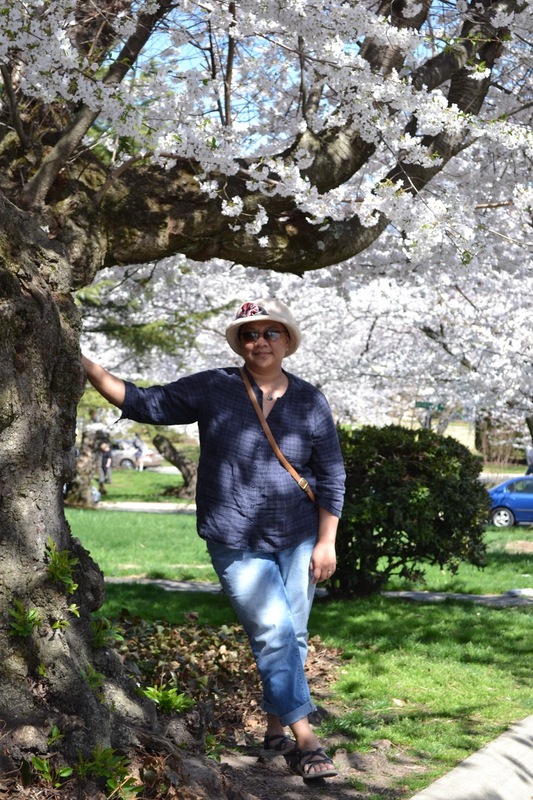 Cherry Blossoms and my favorite hat. I'm struggling - where to begin and what should I write. I am now +109 days since my bone-marrow transplant, and I am taking each day as it comes. My doctor said I can go out now but must stay away from crowded places, from kids and eat at clean restaurants during off hours. It's not that bad of an adjustment, and I am slowly building my muscle strength. Walking is a bit of a struggle these days due to joint pains, but I have to keep moving forward. Family and I were able to enjoy the cherry blossoms in the Bethesda area. The photo above was taken there. We didn't go to the grander cherry blossoms in DC because the place is packed with people. We did manage to do a drive through, and the cherry blossoms were beautiful. I took my first trip out-of-town last week to Kettle Village and Hershey's Chocolate World. My taste for sweets is coming back. My interest in baking is at its peak. This is probably because I have a lot of time to kill. I will be posting about my kitchen diaries on rava ladoo, gulab jamon and more. Kepi and I have our vegetable garden up. The majority of the work fell on Kepi as I'm not allowed to touch dirt because of bacteria and mold. We have tomatoes, bok choy, tomatillo, eggplant and squash growing. I'm also trying to plant chayote and some sweet peppers from Japan. I'm going back to grad school in September, and I'm so excited. I have two semesters left...yay! My hair is starting to grow back just when I'm getting used to wearing hats. I am where I should be. Each day, I keep fighting and I keep counting my blessings. Also, I don't miss work at all. you look so good kayni, keep up the faith that your health will be restored. thank heavens! i am excited with our garden this year. simple things get me excited these days. thank you so much for the unwavering support. God bless. Wow. Nice to see you kayni. Did you know that you look like my ninang pala. Hehehe. Anyway, take good care always. God bless. Hi Eds, Oh I'd love to see a photo of your ninang :). Take care and God bless.